CHRISTOPHER JOSEPH WARD, BETTER KNOWN AS "CJ RAMONE," IS AN AMERICAN MUSICIAN BEST KNOWN AS THE BASSIST FOR THE PUNK ROCK GROUP THE RAMONES FROM 1989 TO 1996. HIS HOMETOWN IS DEER PARK, NEW YORK. HE REPLACED ORIGINAL BAND-MEMBER DEE DEE RAMONE, THOUGH DEE DEE CONTINUED TO WRITE SONGS FOR THE GROUP. CJ SANG MANY WELL-KNOWN RAMONES SONGS. PRIOR TO JONING THE BAND, CJ WAS A MARINE AND A RAMONES FAN. HE WAS SEEN AS A BREATH OF FRESH AIR INTO THE BAND. JOHNNY RAMONE CLAIMED HE KNEW IMMEDIATELY WHEN CJ AUDITIONED TO REPLACE DEE DEE THAT HE WAS RIGHT; COMMENTING THAT CJ "HAD THE RIGHT LOOK." WHEN THE RAMONES WERE INDUCTED INTO THE ROCK AND ROLL HALL OF FAME, ORIGINAL RAMONES DRUMMER TOMMY RAMONE CREDITED CJ WITH "KEEPING THE BAND YOUNG." CJ RAMONE WAS THE YOUNGEST MEMBER WHEN HE JOINED BY 9 YEARS. CJ'S FIRST SHOW WITH THE RAMONES WAS ON SEPTEMBER 30, 1989, IN LEICESTER, ENGLAND, AND HE PLAYED WITH THE BAND UNTIL THEY RETIRED ON AUGUST 6, 1996. AFTER THE RAMONES, HE PLAYED IN A BAND CALLED THE REMAINS, OR THE REMAINZ, WHICH WAS FORMED BY DEE DEE RAMONE, MARKY RAMONE, AND DEE DEE'S WIFE, BARBARA ZAMPINI (BARBARA RAMONE). HE ALSO PLAYED WITH HIS OWN BANDS LOS GUSANOS AND BAD CHOPPER. 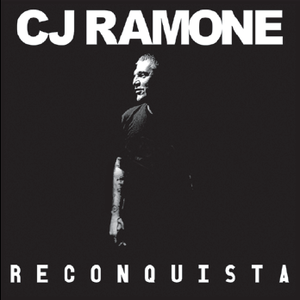 HE NOW TOURS ON HIS OWN AS CJ RAMONE WITH HIS FIRST SOLO ALBUM - RECONQUISTA. CJ LIVES WITH HIS WIFE AND THREE KIDS. CJ IS ACTIVE WITH THE AUTISM COMMUNITY BECAUSE HIS SON HAS AUTISM. HE ALSO VOLUNTEERS HIS TIME AS A GUEST TEACHER AT THE SCHOOL OF ROCK IN FARMINGDALE, NEW YORK.